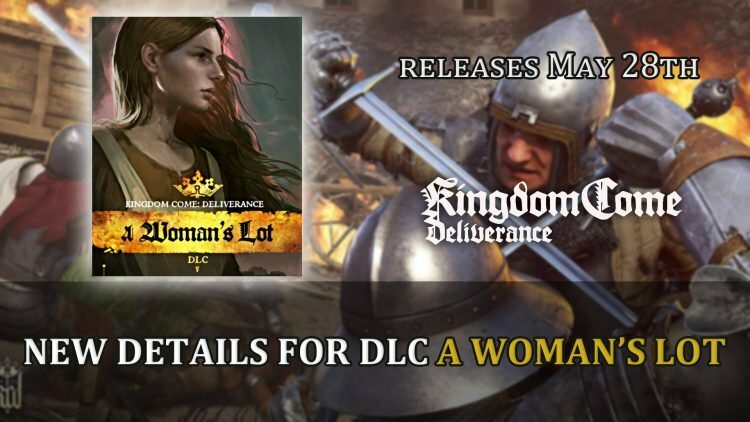 Developers of the medieval action-RPG Kingdom Come Deliverance have shared some new details for upcoming DLC A Woman’s Lot that focuses on the adventure of the character Theresa and is the largest chapter yet. The upcoming premium DLC A Woman’s Lot for Kingdom Come Deliverance will allow players to take on the role of Theresa, who not only gains her own story that takes place before the attack, but gains access to weapons and even her own part of the map. Theresa‘s story although continues throughout the ambush of Skalitz, her priority in the aftermath is to take care of the wounded that have managed to flee from the event. According to a recent interview with Iron Lords Podcast, Warhorse PR Manager Tobias Stolz-Zwilling outlines some of the features players will expect to experience in the new chapter which includes a new dog companion named Tinker. The dog has its own set of abilities which you can level up, including “sense of smell” this will help in sniffing out the enemies that cross your path. But don’t expect the dog to stay loyal if he isn’t treated well, the ability “obedience” will determine if your sidekick will continue to follow you. Praising, feeding and keeping the dog from getting continually attacked by those who pose a threat, will also play a part in your canine friendship. Henry will be making his return in a “big questline” in a “Joan of Arc” styled adventure. What’s also interesting about Theresa’s playthrough, is that your paths will cross with Henry’s, being able to see him in third-person, as the story runs parallel with the events you experience with Henry. Theresa has her own ways to deal with the attackers that still appear around the outskirts of town, using stealth to sneak up behind them, killing them off and of course taking their loot. This isn’t the only way to tackle foes, as you can even send in your dog to attack them. Tinker can do more than just be a personal attack dog, his role also helps you discover new quests, stashes and even find people to help. But it isn’t just Theresa that gets her own furry companion, Henry will have his own too which will also have the same abilities. Kingdom Come Deliverance recently announced their Royal Edition which will release on May 28th for PS4, Xbox One and PC. This will include the base game plus all previously release content and the upcoming A Woman’s Lot. The DLC will also release on May 28th. For more Kingdom Come Deliverance news you can find it here in Kingdom Come: Deliverance Royal Edition Releases May 28th. For your weekly dose of RPG news you can find it here Top RPG News Of The Week: March 31st (Hellpoint, Cyberpunk, Divinity Fall Heroes And More! ).